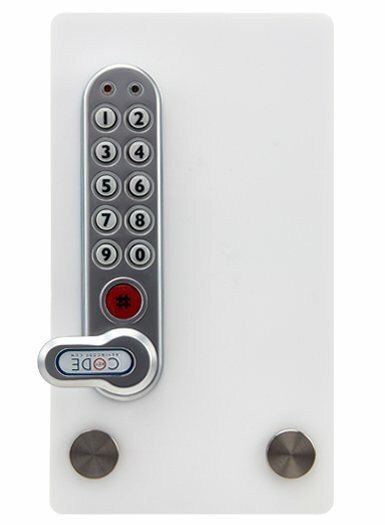 Applications include but are not limited to: lockers, cabinets, chests, covers, anywhere a cam lock is used. Silver finish standard, others by special order. Kit includes two cams and will accommodate any 8mm square cut-out cam. Doors: Ready to fit doors ¾” thick, easily transformed to accommodate from ⅛” to 1″. Cycles: 20,000 openings from 2 x AAA batteries supplied. Battery Level Check: Battery level can be checked via Master Code program with lock LED’s indicating battery level %. Battery Override: Should batteries fail lock can be opened via external 9V battery contact and entry of Master Code. IP55 Rated: Yes, with Gasket (not included). Models/Mounting Options: Vertical, right & left hand.